Most lamb curry you get in the UK is either really fatty or greasy. This dish is light and healthy. Only lean meat is used and hardly any oil in this recipe. Marinate lamb with salt, turmeric, extra hot chilli, paprika, masala, cumin, garlic, ginger and yogurt. Leave it overnight if possible. Preheat the oven to 160c. In a medium sauce pan, fry onions until golden brown, add cinnamon stick and ground coriander. Add the marinated Lamb and cook on the hob for 7 mins. Add Water if necessary before cooking further 60mins in the oven. Reduce when the dish is out from the oven. The gravy should be nice and think. 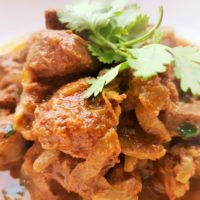 In this recipe, I used Morrisons’ diced lamb(less than 10 pound). All spices were bought locally.